Once we embarked on making over our bedroom, I fell in love with this Ashely Lasseigne fabric. Ashley’s fabric and wallpaper is very well-designed and it’s all inspiring. Very quickly, I decided the fabric would make an awesome upholstered headboard. So I reached out to Ashley and she also agreed with my idea. The project actually didn’t take very long to complete and I’m so happy I took this DIY project on. Sometimes DIY can be a total fail and others it can be so worth the time and effort. This project was definitely the latter. I can say it was truly worth the work. 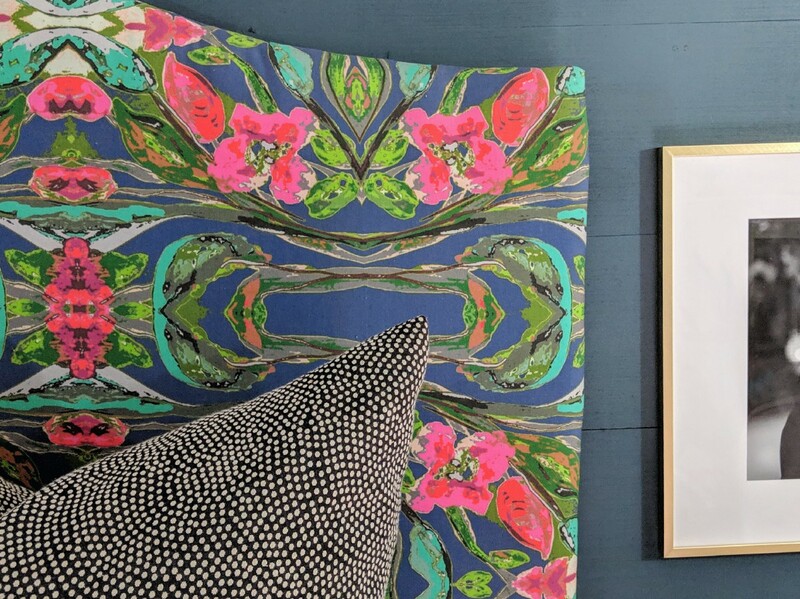 Here’s how I made my very own upholstered headboard, using Ashley’s originally-designed fabric. 1. Purchase plywood to make a headboard template. The plywood I purchased was 3/4 inch thick. 2. Sketch/draw a template onto the plywood. Cut and sand to preferred shape is reached. I went with a camelback shape. My neighbor, Ron, took my rough sketch and made a perfect cut. 3. Add padding. I used a full size egg crate mattress topper to start the padding process. I already had this on hand so that was extra savings. Cut the topper around the plywood template, leaving about an 2 inch margin or so, for stapling around the back. Using a staple gun, staple the topper around the entire template. Trim excess up to the staples. 4. Repeat the above process for the quilt batting and chosen fabric. Make a template, cut, staple with margin in place, and trim. 5. For the corners, you will need to pull and tug to get a proper fabric fitting. Add slits into the back of the cut fabric (the opposite side of the headboard) to help release some tension in the fabric. Staple the fabric as tightly as possible. 6. Hang the headboard on the wall. We used a picture hanging kit that could hold up to 200 pounds. We may update that hardware soon depending on how this one holds up. This project was so worth time and energy. I would definitely do it again! The headboard looks so great thanks to the beautiful fabric. I knew if I would tackle this project I wanted it to look very nice. That’s easier said than done when it comes to DIY projects. However, with Ashley Lasseigne’s luxury fabric, I pulled off a custom look for an unbelievable price. My headboard costs came in right around $170. You can’t beat that for a king size upholstered headboard! Please be sure to check out Ashley’s original designs. She also uses her designs for original art, custom shawls, clutches, and even scarves. You can tell she loves what she does and I’m so happy I could include some of her work in my space. I will definitely be ordering from her again. You should too! What do you think of my DIY headboard? Let me know in the comments below. Life Hacks Ideas: New Brilliant Life Hack and DIY Ideas!